I’m feeling a bit philosophical after yesterday’s birthday and am determined to find a way to use this great photograph in a post. 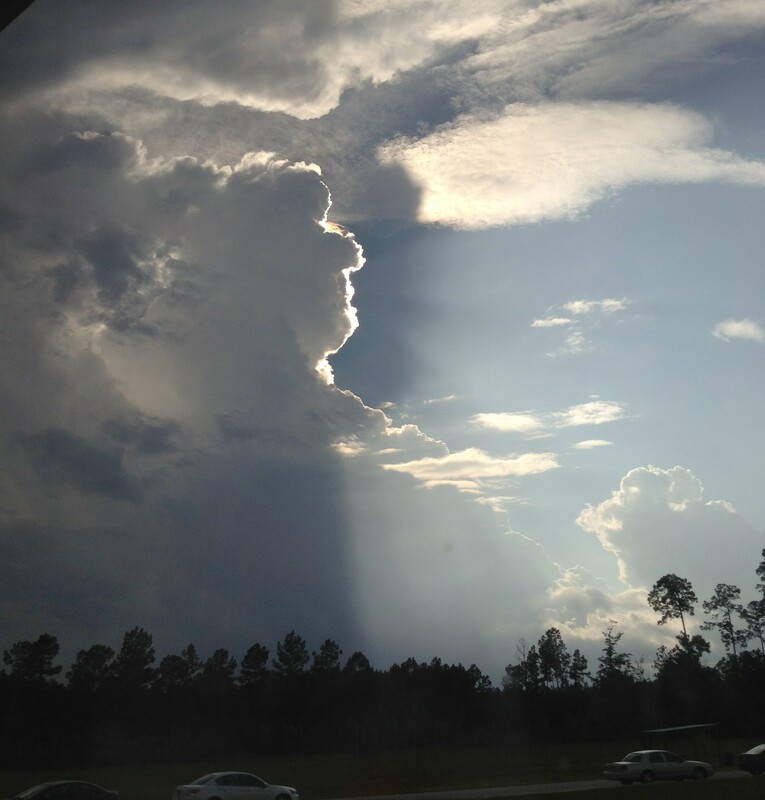 I was standing in a classroom in Blanding Elementary School in Rincon, GA during an Open House last week, and my granddaughter Brooke looked out of the window and said, “Oh look, there a cloud with a silver lining.” It was gorgeous! Don’t think I have a lot of cloudy weather in my life today. I don’t, not unless you consider my brother and I having issues with our meal last night or being disappointed with the movie afterwards. Those are minor things, and fortunately, we both have the ability to say, “That chicken is completely tasteless and definitely not grilled,” and move on. We can watch a disappointing movie and say that we learned something from it. What was Matt Damon thinking??? That’s not to say that I haven’t had my share of storm clouds. Like everyone else who walks the planet, I too have experienced loss, disappointment, and the doldrums. No need to go into detail here. What I will say is that storms always pass. It’s nature’s way for the sun to come out again. It’s also true that often there is something good about clouds and storms and fog so dense that you can’t see through it. “Daddy told me,” she said, leaving my side to go find her father and show him the beautiful sight. Later, I told her that there would be times in her life when she felt sad or gloomy, and that she just needed to remember the cloud with the sun behind it. “Sometimes tough times in our lives teach us lessons,” I said in my best grandmotherly voice. She tilted her pretty face up to look at me as she pondered that remark, and although I don’t know how her 8-year-old mind processed that information, I hope she’ll remember our conversation. One day, it will make more sense to her. There are so many applications of clouds with silver linings. A person could lose a job and find that it offers the opportunity to go back to school and prepare for a totally new and more rewarding career. Someone could get her heart broken so badly that she feels she can never trust or love again. Later she realizes, with relief, that she “dodged that bullet.” A family could be hit with sickness, loss, or disability, and while it’d be hard to find the sun behind those clouds, perhaps the situation will give them increased strength, faith, or courage. What about you? Have you experienced rainbows after rain and sunshine after clouds? Have there been times when there really were silver linings (lessons, blessings, insights) in the cloudy times in your life? “You’re a crazy woman, you know that?” he asked. “But it’s noon…and hot as blazes. 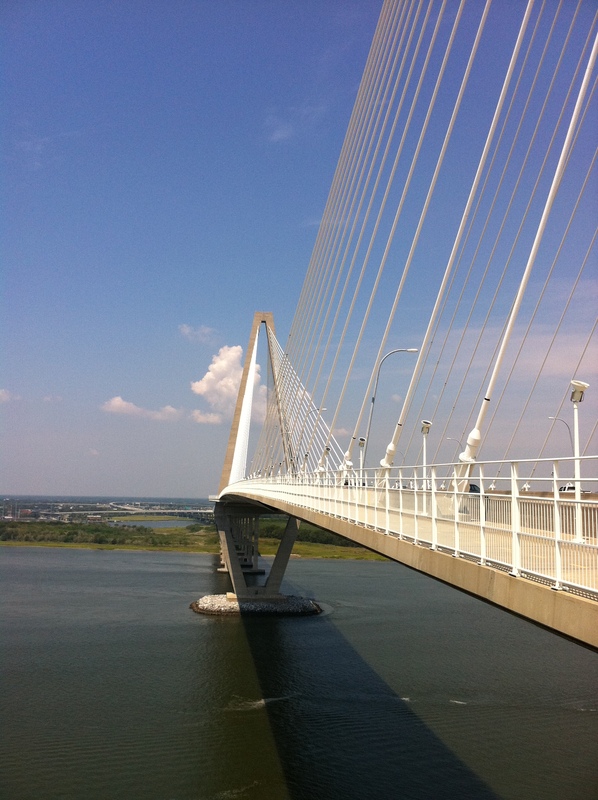 You’ll have a heat stroke,” my husband added, thinking that his words would dissuade me from walking across the Cooper River Bridge yesterday. From my perspective, the only thing crazy about it was that I didn’t have the proper shoes. I was wearing Teva flip-flops, and although I was a bit concerned about chafing, I was determined to cross that bridge. Walking across it was symbolic, and what better time to do it than the day after my birthday and the beginning of the first week of my retirement. As I began the first incline, I heard a horn beep, and to the right, I caught a glimpse of my Highlander crossing the bridge. Already hot, I began to wonder at the folly of the venture, but it was too late to turn back. I had lots of company, mostly walkers, and I entertained myself by observing them and taking pictures of the scenery. One man who was descending the bridge assured me that it was a “teeny tiny” bit cooler at the top. One young woman wearing hospital scrubs walked towards me carrying her shoes, her bare feet walking on the scalding concrete. A few yards later I stopped to take a picture, and when I looked back towards the Mt. Pleasant side, I saw her taking a break, sitting down with her legs drawn up. I thought about her off and on all day and hoped she was okay. As I neared the top of the second crest, a man zoomed by me. “Show off,” I thought, a little envious of someone who could move so quickly in the sweltering heat. My running days are over. I’m a walker now. Still, once in a while I feel a little twinge of regret or envy or something whenever I see a zoomer, especially when I’m moving about as fast as I can move. I consoled myself by saying, “What’s the hurry? It’s the journey, not the destination,” and that worked pretty well. By the time I crested the second incline and started down again, I saw him. He was standing by the railing, breathing hard and wiping his head, face, and neck with a towel. I felt fine as I breezed right by him, thinking of Aesop’s tortoise and hare fable. I snapped two pictures of scripture verses that someone had etched into one of the concrete structures on the bridge. I didn’t know whether to be amused or angered. How can a person who’s serious about spreading “the Word” go around defacing property? Near the end of the crossing, a young man sporting a pony tail, numerous tattoos, and a finely-toned body flew by me. Moments later, a young woman wearing yellow shorts and a black sports bra did the same. “Ah, youth,” I thought. I’ve always loved bridges, and the Cooper River Bridge (don’t bother telling me that it’s the Arthur Ravenel Jr. Bridge) has always been a favorite. My mother once told me that I cried and begged to take it home with me when I was a toddler. I didn’t understand about bridges then, how they took you from one place to another. I do now. Crossing the 2.5 miles awesome bridge yesterday symbolized another crossing over for me. There’s the obvious one, the birthday thing, but then there’s the retirement transition too. I can’t get to what’s next without leaving the shore and crossing over. It was hot. I had to work hard. There was a gentle breeze near the top, and a friendly soul encouraged me by telling me about it before hand. Some people fell by the wayside, especially if they were ill-equipped for the journey (improper shoes) or they went too fast and burned out. Some who were young and fit zoomed by me. Hmmm. Am I describing yesterday or the working world in general? In both cases, moving at my own pace, I made it to the other side…of the bridge and to retirement. I hope the young woman with the painful feet takes better care of herself on her journey. And that the speedster slows down and enjoys the trip. Is anyone out there old enough to remember Joe Ryan, the Congressman who was shot and killed as he tried to leave Jonestown, Guyana 32 years ago? I heard his daughter Erin’s voice on NPR the other morning, and her voice and message brought the whole, sad story back to mind. Is anyone out there old enough to remember Leo Ryan, the Congressman who was shot and killed as he tried to leave Jonestown, Guyana 32 years ago? I heard his daughter Erin’s voice on NPR the other morning, and her voice and message brought the whole, sad story back to mind. Her father and others had flown to Guyana to investigate Jim Jones’ and the People’s Temple, and the congressman never returned. Erin told of her love and admiration for her father…and of her “gut wrenching” heartache when she heard the news. Evidently, he had been involved in somewhat dangerous situations before, and neither of them perceived this trip as ominous. In fact, they had shared dinner in her Georgetown apartment on the eve of his departure and had talked about topics such as her classes and her cooking skills. A few days later, Erin heard a flash news report on television reporting that a United States congressman had been shot while attempting to leave the airfield in Guyana. Was it her father? Had he been killed, or was he merely injured? Since this was back in the day prior to instantaneous news, she had to endure some painful hours waiting, waiting, waiting. As the days went by, reports from Guyana became even more horrific. Jim Jones, the leader of the cult, had persuaded over 900 people, about 1/3 of whom were children, to commit suicide by drinking a kool-aid type of drink. He was found with a gunshot wound in his head, reportedly self-inflicted. When I heard Erin Ryan’s words, I was traveling to see one of daughters and her family, and a couple of thoughts struck me. Love and appreciate those you love. Look at them, listen to them, read books to them (grandchildren), hug them, and savor each moment of your time together. When and if separation comes, count yourself fortunate to have known the person. Remember those special times, but don’t get stuck in the past like Lot’s wife. Move forward. 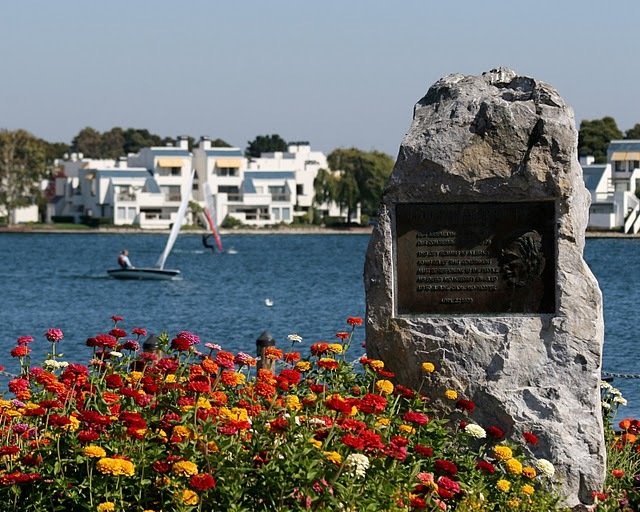 Author jayne bowersPosted on January 17, 2011 Categories attitude, children, choices, family, lessons, life, NPR, psychology, relationships, religion, thoughts, tragedyTags Congressman Leo Ryan, families, Guyana, tragedyLeave a comment on Defining Moment? Yesterday I read of an aftershock hitting a poor, mountainous region of Sichuan province in central China that toppled thousands of buildings and injured hundreds of people. This follows on the heels of the worst earthquake in three decades with a death toll of over 62,000 people. While everything associated with the situation is tragic, the tiny orphans are the most heartbreaking. Then there’s the Myanmar cyclone and the ongoing loss of life there; at least now it seems that a turning point has been reached that will allow foreign aid workers entry into the area. We’ll see. Closer to home, today’s The State reports that a guardsman from SC was killed in Afghanistan when his unit was attacked. All that is sad, bad stuff and it makes me think of a conversation I had with some of my lunch buddies last week. We were discussing religion, God, His purposes, the Old Testament vs. the New Testament, whether Job really lived, and so forth. Towards the end of our hour, someone wondered how God could allow such tragedies as those in China and Myanmar to occur…not to mention the thousands on a smaller scale. No one had any answers that day, and I don’t have any today either. No, that really doesn’t satisfy all of our questioning and seeking, but it does remind us that perhaps our minds are too small to comprehend the events of the world in the same way that God does. After all, He’s God, and I’m Jayne, a mortal who breathes, walks, talks, and enjoys chocolate because it’s His will that I do so. I have to remind myself that I “see through a glass darkly.” At the same time, not believing in God because surely He could have stopped such catastrophes and loss of life doesn’t change the situation. In fact, what else is there to believe in? Does not believing in an omnipotent being aid in understanding or grant peace? To me, the answer is no. In fact, not believing is a little scary, and for now I’m content to follow Heber J. Grant’s advice to let the mysteries of heaven wait until I get to heaven.